Parents Amie and Paul were devastated when they were told a rare condition in the womb meant that tiny Ellis was not growing properly. At one point, doctors said Ellis had just two weeks to live. If he died in the womb, it could also affect Blair’s chance of survival. A termination seemed the only solution. The couple felt they could not take that step and decided to leave it to fate. Instead, Amie drank five litres of water a day and cut out chocolate and sweets in order to improve her babies’ chances. Both were born in June last year at just 29 weeks. Amie, 29, who lives in Glasgow, said: “The doctors said to terminate Ellis to save Blair but now when I look at them they wouldn’t be without each other. It’s a bond that just couldn’t be broken. The couple, who also have an eight-year-old son, Lewis, were thrilled when they discovered they were having twins. Just five weeks after the scan, doctors told them their twins were sharing a placenta and Blair, the bigger baby, was getting much more of the nutrients from it than Ellis, who was much smaller. Amie recalls: “They showed us a scan of the boys and it looked like he was shrink-wrapped in his amniotic sac. He hardly had any fluid in there at all and he could hardly move. It was awful to see, knowing that the twins were in such danger. She added: “We wanted to let nature take its course and see if both babies would live. “I looked on the internet to see what could help improve the function of a placenta. If my placenta worked better, then Ellis may get more nutrients. “It said to drink five litres of water a day and eat lots of protein. So that’s what I did. I cut out sweets and chocolate and just ate lots of chicken and eggs. Twice a week I kept having scans and each time he was still there. He had defied the doctors’ predictions. 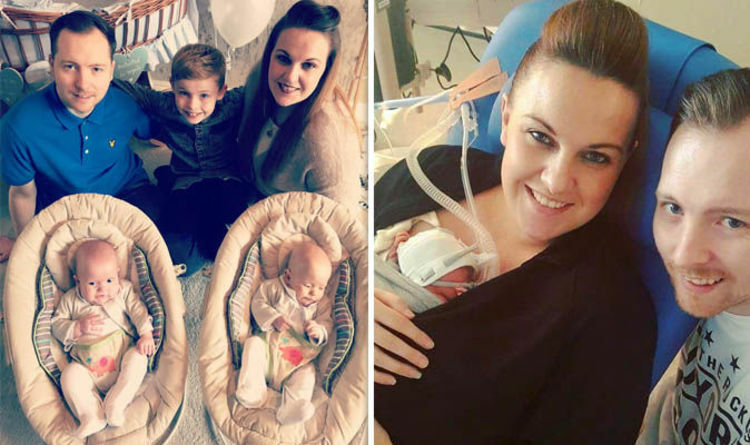 Doctors were forced to deliver the twins 10 weeks early because there was a problem with one of Ellis’s heart valves. He weighed just 1lb 7oz and Blair was 2lb 8oz. Ellis then underwent a bowel operation and eye surgery as a result of being born prematurely. He also suffered a series of infections. Now, at eight months old, both babies are thriving. “They were such incredible little fighters,” said Amie.